Pampered in Paradise – Villa Celeste is one of our Beachfront Luxury Villa in Puerto Vallarta. Imagine yourself in a private and glorious oceanfront estate overlooking the beautiful Bay of Banderas, the gentle blue bay that beckons travelers to world famous Puerto Vallarta, Mexico, the jewel of the Mexican Riviera. Experience magnificent vistas from the ocean rocks at Mismaloya to the northernmost point at Punta Mita, along with mountains, ocean and blue skies while enjoying cool ocean breezes. Luxuriate with incredible sunsets as "el Sol" dives behind the Pacific rim. Welcome to Villa Celeste, one of Puerto Vallarta's finest vacation retreats! 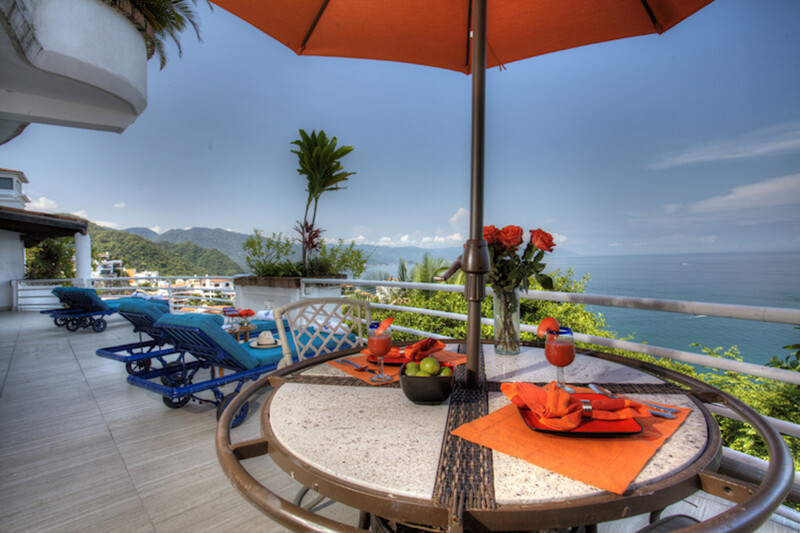 Do not miss the chance to rent out our Beachfront Luxury Villa in Puerto Vallarta. An incredible 5 bedroom, 7 bath majestic Spanish-style estate on Conchas Chinas beach, Villa Celeste is the epitome of Mexican luxury. Some even consider it romantic, as many weddings have taken place under its famous arch. 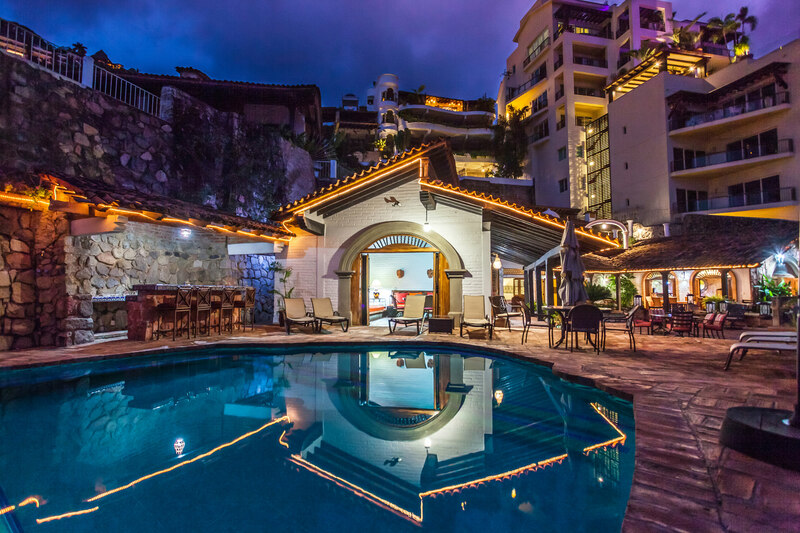 Situated on a beach in Conchas Chinas, the premier resort area of Puerto Vallarta, Villa Celeste is secluded yet accessible, removed from the crowds and traffic yet close to the center of town, with its charming shops, street vendors, great restaurants and famous cobblestone streets. Other award winning restaurants are just a few steps away. After a scenic drive through town arrive at Villa Celeste and notice the tall graceful palms in the driveway that await you. Enter the stone walls surrounding Villa Celeste with its 12,000 square feet of luxurious living space and begin to experience what paradise really is and is available for Vacation rentals. As you enter the grounds on your left you find one of the largest private pools in all of Puerto Vallarta with magnificent ocean views. The villa is surrounded by lavish and lush gardens that give you a sense of complete seclusion thus is one of our beautiful Beachfront Luxury Villa in Puerto Vallarta. The Palapa roof covers a hammock large enough for two, allowing you to enjoy the sunset and view of the Bay of Banderas with margarita in hand. Vacation Rental Amenities decorated with beautiful Mexican artwork, murals and antiques from all over Mexico, Villa Celeste’s vacation estate comes complete with a full time staff at your disposal, consisting of a chef, houseman and maid. When you arrive you will be greeted and introduced to your staff - trained to make your stay as memorable as possible. They are there for your total comfort and enjoyment hence making not renting our Beachfront Luxury Villa in Puerto Vallarta for your vacation stay be it romantic or any other nature a missing of fun on your part. You will also be given a tour of the estate so you are familiar with its amenities. With your choice of dining – inside or out, both areas will seat 12 comfortably - your personal chef will surprise you with the culinary delights of Mexico, making each meal an exquisite pleasure! Our menu is more extensive that most restaurants and will delight you with its variety and imagination. All meals are prepared fresh by your own personal and talented chef. On the main level of Villa Celeste you will find three Mexican Hacienda style bedrooms and private bathrooms, the large & luxurious living and indoor dinning area with guest bath, and kitchen facilities. The family room with bath, opens onto a huge terrace area with the large crystal clear in ground pool, poolside bar, outside shower, lovely Palapa and hammock. Other comforts of your family/game room include, cable TV, and stereo system. The upper level consists of two stunning master suites, with their own private entrances, a large wet bar for private parties, ceremonies, celebrations and weddings. Both master suites contain their own private and spacious bathrooms, satellite flat panel TVs and are accented by a breathtaking view of the Bay of Banderas. One of the master suites features a beautiful marble Jacuzzi for your pleasure. All bedrooms are air conditioned. The outside lighting system is designed to create an atmosphere of luxury and safety. To further complement your Mexican experience is the presence of the ever-present roof top iguana mascots who are spoiled almost as much as the guests. Town is a short and inexpensive Taxi ride. For fitness buffs it can be walked to along the beach or via the main road. All activities including cars, mobile phones, tours etc. are easily arranged by your personal concierge with a simple phone call. We love to pamper our guests - no wonder we have so many repeat visitors. Villa Celeste offers easy access to all the enchantments and adventure that makes Puerto Vallarta, Mexico special. Beaches, nightlife, excellent cuisine, sun and fun! Escape or retreat from the pressures of the outside world and step into Villa Celeste for a taste of tranquility, luxury and indulgence. Puerto Vallarta and Villa Celeste! A truly unique and special combination for your vacation, honeymoon, wedding or a corporate retreat.